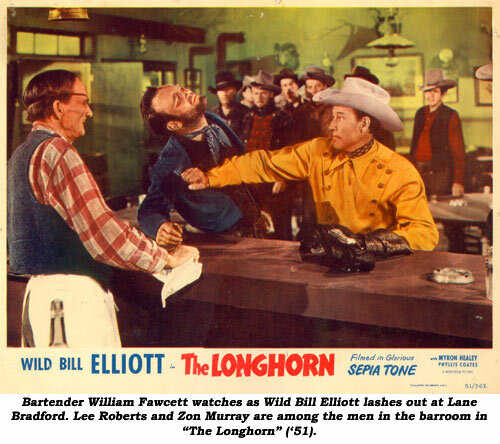 THE LONGHORN (‘51 Monogram) In his first at Monogram, Wyoming rancher Elliott has a vision for a new breed of cattle, cross-breeding his hardy Texas Longhorns with Herefords to develop a heartier, heavier beef stock. To do this he must drive a herd from Oregon to Wyoming. Supposedly trusted friend Myron Healey is in reality planning to grab off the herd with the aid of rustlers. 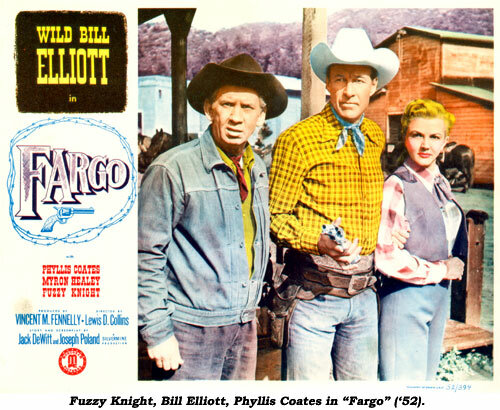 En route, Bill saves Myron’s life, leaving him to recuperate at the home of Phyllis Coates as he hires a trail crew of tough ex-outlaws trying to go straight. Near home, at the proposed time for the rustlers to attack, Healey has a change of heart and helps Elliott beat off the gang, only to lose his own life. Remade as “Canyon River” in ‘56 with George Montgomery. 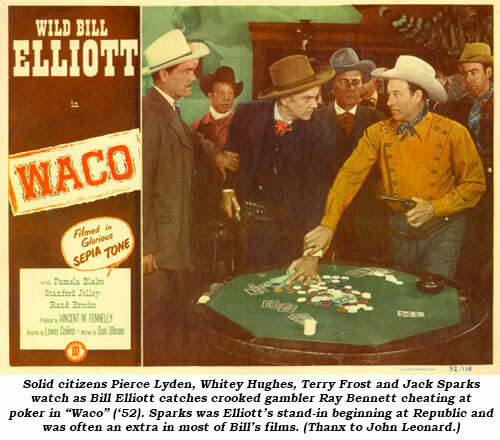 WACO (‘52 Monogram) Still emulating the good-badman roles of his idol William S. Hart, Elliott is forced to flee Waco with a price on his head despite acting in self defense after killing a crooked gambler. After joining up with I. Stanford Jolley’s wild bunch, Elliott is shot and captured during a bank holdup, but returned to Waco by two of its leading citizens who have faith in his true innocence and ability to drive out the lawless element terrorizing Waco. Elected sheriff, Elliott encounters tangled trails when he’s faced with arresting the old outlaw, Jolley, who once befriended him, and in dealing with the daughter of the gambler he killed earlier, Pamela Blake, who is bent on revenge. Remade as “Badlands of Montana” with Rex Reason in ‘57 and again as “The Lawless Seven”, an episode of “Laramie” in ‘61 with Robert Fuller. 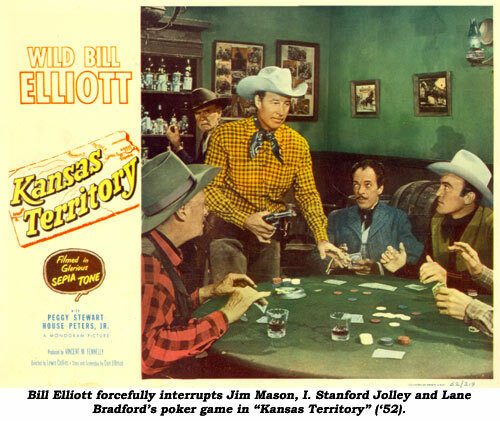 KANSAS TERRITORY (‘52 Monogram) Elliott, wanted in Kansas on old Civil War charges, returns to the territory when he learns his brother has been shot and killed. To Bill’s confusion, he finds everyone in town hated his detestable brother and resents him because of his name. At first convinced his brother has been wronged, Bill gradually comes to realize his mission was a mistake but is still determined to gun down his brother’s killer. But who is the real killer? One of Wild Bill’s best latter-day Monogram B’s. FARGO (‘52 Monogram) Coming to Fargo to investigate his brother’s death, Bill finds his brother had pledged to convert the area into rich farming land but was killed by those who opposed this idea. Bill vows to follow through on his late brother’s pledge, introducing barbed wire to the area. This is the Elliott that contains the violent scene where Bill is inhumanely wrapped up in barbed wire and left for dead by Myron Healey and his boys. One of Elliott’s best at Monogram. 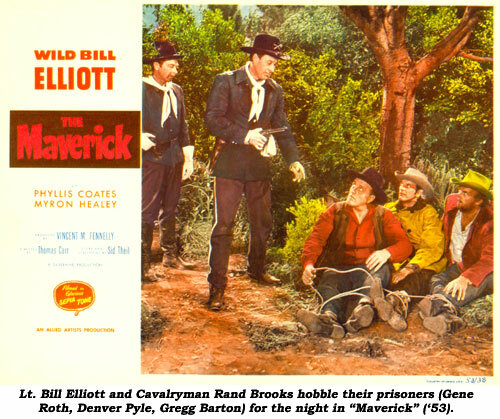 THE MAVERICK (‘52 Allied Artists) It’s a real llooonnnggg trek as Lt. Elliott’s Cavalry detail escorts four prisoners across the plains for trial. A gang of outlaws, friends of the prisoners, are trailing, waiting to ambush them and free the four. Along the way, Elliott’s detail picks up a wagon with Phyllis Coates and Grandma Florence Lake. The usually acceptable music score by Raoul Krausharr gets quite wearisome here, making the trek seem quite longer than its 71 minutes. 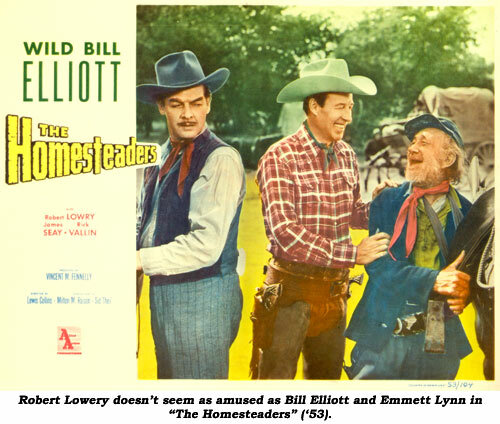 HOMESTEADERS (‘53 Allied Artists) It’s a long dry haul across the badlands for homesteaders Elliott and Robert Lowery as they trek a load of “hot” dynamite to Oregon to clear land for the settlers. Elliott has to deal with a mutinous trail crew of ex-military convicts, Indian attacks and the double-crossing Lowery who has made a rotten deal with outlaws. 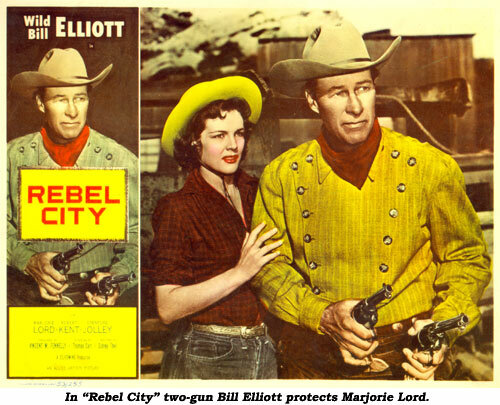 REBEL CITY (‘53 Allied Artists) Elliott’s freight operator father has been stabbed to death after receiving counterfeit payment for the sale of his wagons. Going to work for Marjorie Lord’s freighting business, hoping to solve the murder himself, Elliott uncovers a nest of Copperheads responsible. Plays like a murder mystery on the range, with more investigation and less action than usual. 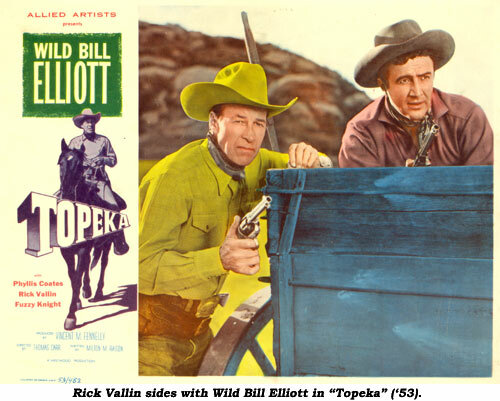 TOPEKA (‘53 Allied Artists) Decidedly in the good-badman William S. Hart mold Elliott so admired. After a series of bank robberies, Elliott and his outlaw gang decide to hole up in Deer Creek. Just so happens casino owner Harry Lauter runs a protection racket there. Learning of the scheme from eatery owner Phyllis Coates and Fuzzy Knight, Elliott and his boys move in. Planning to take over for themselves, and beating Lauter’s men at every turn, Elliott wins the respect of the law-abiding townsfolk who appoint him sheriff. At first he seizes the opportunity, knowing it will help him take over, but then he and his closest friend (Rick Vallin) see an opportunity to shed their outlaw ways and go straight. The rest of Elliott’s gang joins forces with Lauter, planning to loot the town. Remade on TV as an episode of “Cheyenne” with Clint Walker—“Decision at Gunsight”. 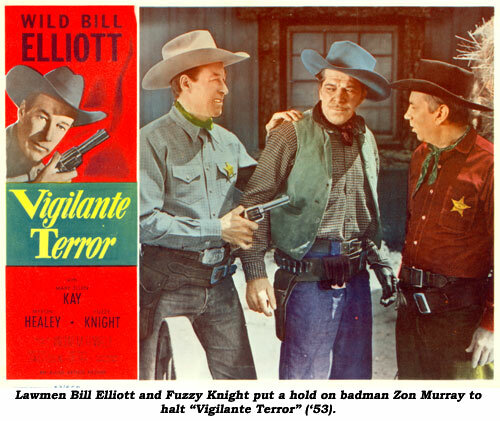 VIGILANTE TERROR (‘53 Allied Artists) Respected citizen Myron Healey has his outlaws pull robberies while his vigilantes plant the evidence on someone else, thereby deflecting suspicion from the real outlaws. Elliott becomes sheriff after his brother is hung by vigilantes. 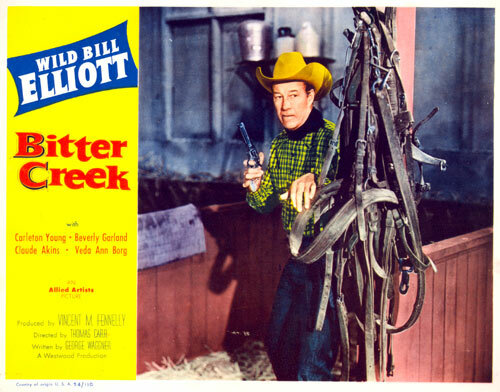 BITTER CREEK (‘54 Allied Artists) Tough, taut tale has Elliott out to avenge his brother’s death. This is the first western for both Claude Akins and Beverly Garland. 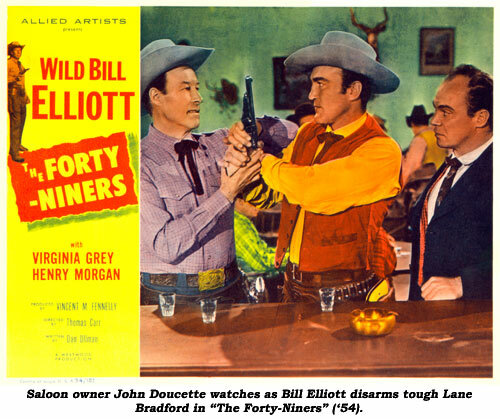 THE FORTY-NINERS (‘54 Monogram) Trackdown tale with near-“Dragnet” style narration by Elliott as a Marshal seeking the identity of three murderers in gold rush California. 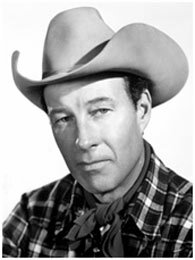 A friendship with card sharp Henry (Harry) Morgan eventually leads Elliott to Sheriff Lane Bradford and saloon owner John Doucette. Elliott’s last western after a 16 year run. Unfortunately, Bill leaves the screen with a mild whimper instead of a big bang.